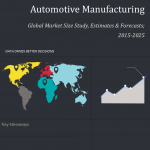 The global Automotive Manufacturing industry has significantly changed over the past 10 years. While the heavy vehicles have witnessed flourished growth, the light vehicles had to cope with deteriorating market conditions. Thus, it is projected that future manufacturing technologies will move towards the manufacturing of parts with complex internal structures which may fuel the demand for advanced electric vehicles. We at Bizwit Research has summarized some of the trending titles under Automotive Manufacturing which are mentioned below this section.